Meet our new character, Dio Sukuri the Copycat! I’ll leave it completely up to you if young Dio is a boy, girl, both, or neither (hey, if Krazy Kat can do it, it’s good enough for me). Back in the day I did a lot of blabbing below the comic (as I am wont to do…and I guess still am), but now you can read more in-depth backstory and other fun factoids in the Patreon comic posts. I’ll be posting this story a page at a time, but on Wednesdays instead of Sundays. If you’d like to see these pages sooner with some extra content (i.e.rambling from me, namely regarding a relatively bad continuity error on this very page! ), consider tossing a buck or two to the SCAPULA COMICS Patreon page. SCAPULA: MEMENTO MORI: The ‘Missing’ Book is Here! 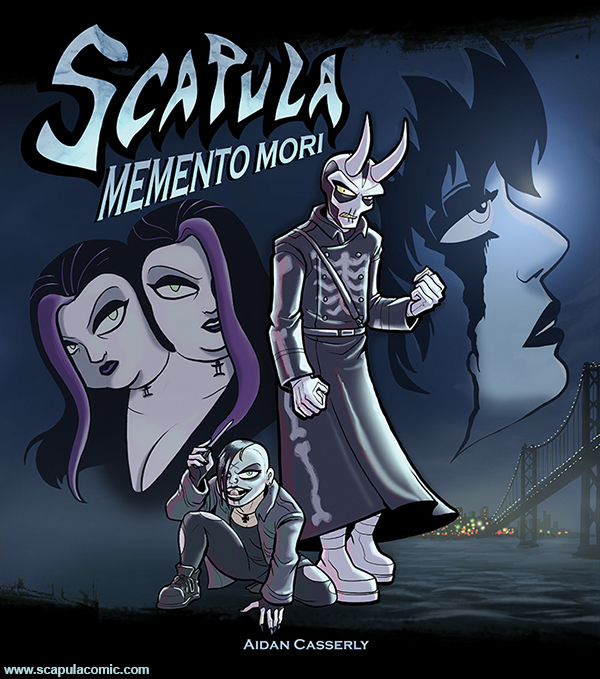 After being unavailable for years the “lost” Scapula book is finally here; collecting the largest story arc in the entire series, Scapula: Memento Mori appears now in print and in full-color for the first time ever. This final book completes the webcomic run in print form and is not to be missed by any die-hard fans of the series. Hop on over to the Scapula Store to grab it while you can!